I am very fond of Middle East patisserie. There are few Arabian patisseries in Milan, quite good actually, but do it yourself is always better: you can choose the amount of honey, butter and sugar, so it is not too honey, too buttery or excessively sweet. And you can play around with ingredients. Baklava defines a sweet treat made with phyllo pastry and chopped nuts. But why not add some chopped dried fruits, as figs and apricots? And some spices too, as cinnamon, fennel seeds, nutmeg and ground ginger? My inspiration was from Dessert des mille et une nuits, Èditions S.A.E.P., 2004, an extensive collections of Middle-East and North Africa treats, from loukums to jams. Prepare the filling, mixing all the ingredients. Let it to rest for a few hours. Cover a big ovenproof rectangular dish with greaseproof paper. Roll out the phyllo pastry and butter each sheet. Cover bottom and sides with 6 buttered sheets of pastry. Spread half of the filling, cover with 2 buttered sheets of pastry, spread the rest of the filling, and cover everything with the remaining buttered phyllo pastry and the remaining melted butter. With a sharp knife, cut along to form little squares. Cook in a hot oven, at 180° C, for 40 minutes. In the meanwhile, prepare the syrup, melted the sugar with all the other ingredients for 10 minutes. 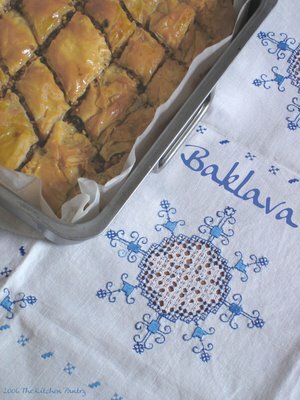 As soon as baklavas are cooked, take them out of the oven, pour over it the syrup, and let it cool. Let it rest overnight in the refrigerator. Serve at room temperature. About the picture: the tablecloth under my baklava is a gift form my husband’s grandma. She lived for a good part of her life in Morocco (she came back in the middle of the 60’s), teaching French to Morrocans pupils, at the local school, and she brought back many memories and wonderful gifts, like this gorgeous tablecloth. I’m glad you left a message on my blog so that I could discover yours. Being a Turk, I must admit I’m impressed both by courage and talent you showed in making baklava (I wouldn’t even try), vow! Also, the tablecloth is beautiful.